The “Wa Yay” on the Potty	Are You Awake? Every child has a dream to grow up and be a __________. Not all dreams are the same, and each child has his own ambitions and desires. There are only a few things I ever remember wanting to be. My first memories of a dream job were wanting to be a pilot. I wanted to fly. I still do, actually. Back then I wanted to fly commercial airliners. I actually used to dream about flying, but not in a plane…just running through a field and taking off like Superman, flying over trees, houses, buildings and the world. I haven’t had those dreams in many years, but I vividly remember those dreams, and how they inspired my desire to learn how to fly. Besides, being a pilot has a certain allure to it that just permeates “cool.” And then I found out that in order to be a commercial pilot, you have to have good vision. I don’t. So I moved on to wanting to be a doctor. I carried this dream for a few years, moving from one specialty to another. I remember wanting to be a brain surgeon, a cardiologist, and then an emergency room doctor. I think I’ve always had a desire to help people, and this seemed like a logical fit. It didn’t hurt that it also is a job that speaks “cool”…and makes good money. Then I found out that to be a doctor required 4 years of college…followed by 4 years of medical school…followed by more schooling for the specific specialty. That sounded like more than I could handle. So the next logical choice was a police officer. After all, what job is cooler than one where I can help people by shooting bad guys? That was about the time the tv show COPS was in its prime. It didn’t take long to figure out that most of being a cop is listening to people fight and trying to figure out who’s lying. Like I don’t have enough problems of my own, I want to mitigate everyone else’s? And running…I hate running. Being a cop means you have to be able to run after bad guys. I was so out of shape in my youth that the mere thought of running took my breath away. I knew right away that I’d be fired the first time a bad guy ran…because I’d be the guy to shoot him in the back instead of running after him. Which brings me to what I do today. I remember well what first turned me on to firefighting…the “Kansas City Six”. On November 30, 1988 a fire at a construction site in south Kansas City involved a pickup truck and two storage trailers. Shortly after the first two engine companies arrived, a series of explosions rocked though the site, killing six firefighters. The investigation afterward revealed that the two storage trailers contained 40,000 pounds of explosives, some of which were mixed with kerosene. The deaths left the community in shock, and coverage of the incident was all over the place. At the time, I was a sophomore in high school, living only 90 minutes south of Kansas City. We couldn’t escape the media coverage. When the firefighters were laid to rest, the memorial service was held in Arrowhead Stadium, the NFL stadium where the K.C. Chiefs play. My memory of the event was that the stadium was near full. In looking back through the archived stories in the papers, reports say that over 5000 firefighters turned out to pay their respects, in addition to countless citizens, and friends and family of the six firefighters. And that’s what impressed me. To see that many people come from all over the country…some from other countries altogether…to say goodbye and honor six strangers…people they didn’t know, other than through their common career…was inspiring. That’s what got my mind thinking that I didn’t want a job just to be cool or to make lots of money. I wanted to be a part of something bigger than myself…part of a brotherhood that takes care of its own…a group that has a rich history, filled with tradition, honor, sacrifice. It would take me several years to begin turning that dream into reality. After marrying your mom in ’93 and moving back to Nevada and buying our first home, I was a manager at McDonald’s. I’d worked my way through high school and most of my college years at McDonald’s, and it was a natural fit to move into management as we settled into a home and our lives together as a newly married couple starting out anew. It was 1994, and I saw an advertisement in the newspaper seeking volunteer firefighters. With a friend from work, I applied…and they actually hired me. The FD there has one station with a paid crew of 4, so they rely heavily on volunteers to fill out manpower needs on varying incidents and during times high call volume. With no experience whatsoever, I was handed fire gear and welcomed to the ranks. Within a month or so, I had my first fire, and the bug was in my blood. Once the firefighting bug is in the bloodstream, it’s there for life. I was content to be a volunteer, not giving much thought to doing it as a career. At the time, the department was young…there was little likelihood that they would be hiring anytime in the near future. After volunteering in Nevada for a little over a year, I changed jobs, taking a management/ownership role with Sonic. That required a move, so the dream was on hold for now. Ironically, within a few days of accepting the position with Sonic, a paid position opened up, and the FD was seeking someone to fill it. I didn’t apply, because I’d already committed to Sonic, and you know me…once I’ve given my word, I’ll honor it. So, we moved. In retrospect, I’m glad I didn’t apply for that position, because if I had been hired, I’d be there now instead of where I am now. We wouldn’t have SD and DWS, and life wouldn’t be the same. God rewards the patient…and those who honor their word. We settled in St. Charles county in August 1995, and within about a year I took a volunteer position with St. Charles Fire Protection District. I truly enjoyed those years…getting calls at all times of the day and night, leaving meals on the table to be eaten later and leaving bed at 4:00 a.m. to do something I love. My sights were set on moving up the chain within Sonic, though. I was in pursuit of money, prestige and power. However, God humbled me, and in November of ’97, my time with Sonic had come to a close…a story for another day. It was time to move on. When I left Sonic, I knew that within 5 months, the voters in our fire district would be presented with an opportunity to merge our fire district with the St. Peters Fire Protection District. If that vote passed, the new fire district would hire 27 paid firefighters, starting from within the ranks of its volunteers. I did my time, trained to pass the physical agility test, and in the summer of ’98, I was hired. My first day on the job was July 20, 1998…we spent 8 hours a day for the first five days in orientation, and I started my first 24 hour shift the next day, my 25th birthday. The night of my first shift, my truck was first in on a house fire. What a birthday present! I love my job. Yesterday marks the anniversary of my 13th year on the job, and I can’t imagine doing anything else. 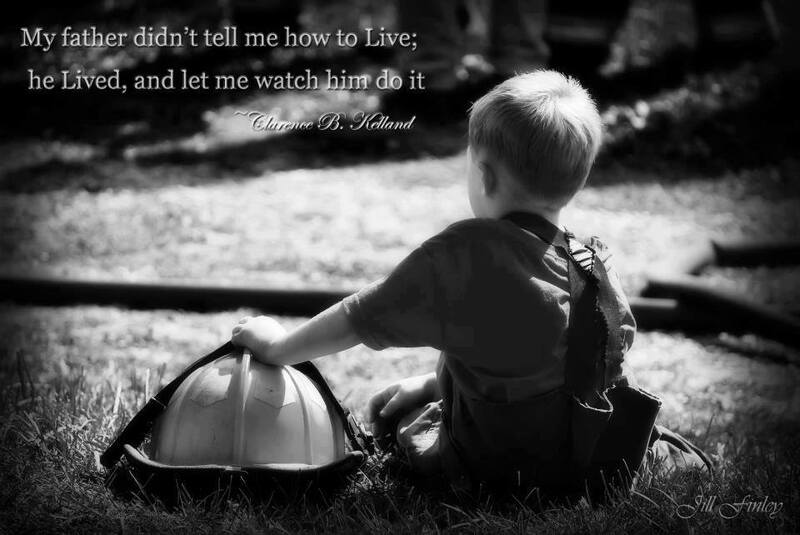 Whatever you decide to do with your life…whether you follow my footsteps into firefighting or flip burgers at McDonald’s…do it with honor, humility and pride. No matter what career path you choose, know that I’m proud of you. Not for what you do or how you do it…but for who you are. Follow your dreams and don’t give up on them when you face adversity. Spread your wings and fly. I’m turning 38 in four days, and I still have a dream to fly. I haven’t given up on that dream, and one day I may just learn how to fly.